Toyota and Lexus, emphasized their mission to promote sustainable mobility in the UAE at the World Future Energy Summit in Abu Dhabi. The companies participated actively in a series of talks on how to make green mobility mainstream and the global mega trends which are shaping the energy transformation in big cities, as well the potential of hydrogen to change the global mobility landscape. Toyota has been at the forefront of pioneering Hybrid Electric Vehicle technology (HEV) from 2008 and has been a frontrunner of zero-emission Fuel Cell Electric Vehicle mobility (FCEV) from 2017. Toyota was represented by Dr. Prof. Katsuhiko Hirose, Professional Partner and Senior Advisor for Future Technology, Toyota, and Matthew Clark, General Manager Toyota Sales Operations at Al-Futtaim, in three different panel discussions held as part of the World Future Energy Summit. Both Lexus and Toyota used the event to showcase some of their latest HEV and FCEV models and the advantages and practicality of both technologies were explained to visitors. “Our message, since the introduction of the first HEV in 2008 has been that HEV technology is a readily available solution for the country’s environmental challenge. To up the ante, last year we inaugurated the first hydrogen refilling station in the UAE to mark a new era of electric mobility, which is the stepping stone for the gradual detachment from fossil fuel and a greater reliance on electric power through the promotion of Fuel Cell Electric Vehicles,” said Clark. 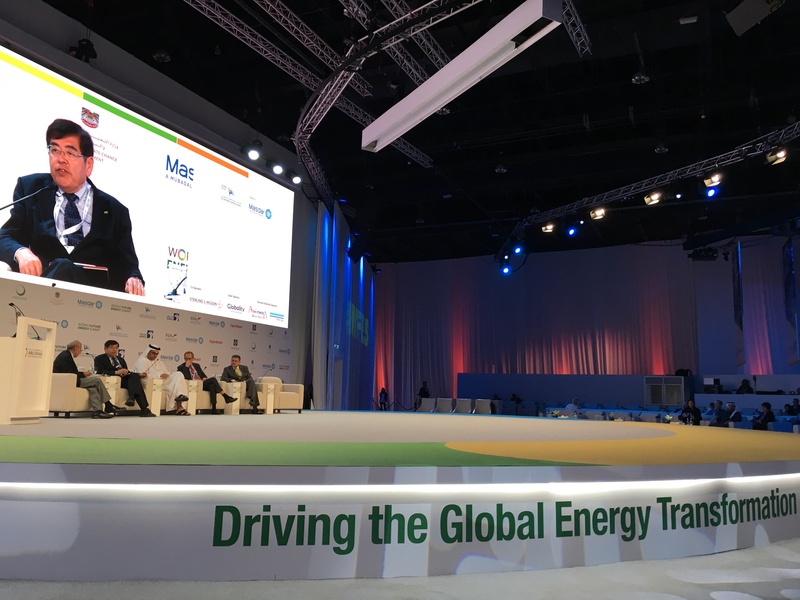 He added that the World Future Energy Summit at Abu Dhabi Sustainability Week served as an excellent platform for the company its drive to bring more sustainable motoring solutions to the UAE, and the key role FCEVs can play in achieving a low emission hydrogen based society, to align with targets set by the UAE Vision 2021. Dr. Prof. Katsuhiko Hirose, Professional Partner and Senior Advisor for Future Technology, Toyota took part in a panel discussion called “Urbanisation: A global mega-trend driving the energy transformation discussion”. The discussion dealt with strategies that large cities can employ in the future to cater to the energy, clean water, transport and waste management needs of urban communities. Last year, during the Abu Dhabi Sustainability Week, Mr. Takeshi Uchiyamada, Chairman of the Toyota Motor Corporation Board of Directors announced a collaboration agreement with Masdar, Abu Dhabi National Oil Company (ADNOC), Air Liquide, and Toyota distributor Al-Futtaim Motors in a joint research program to explore the potential of hydrogen energy use in the United Arab Emirates (UAE) for the creation of a sustainable, low-carbon society.